Today my wife and her sewing friends met at our place, so the usual plan of waiting around home until Caleb wakes up from his post-lunch nap needed changing. Isabel and I decided that we would visit SASMEE this afternoon. This was encouraging, because Isabel had already been in the bakfiets for at least an hour earlier in the day, first to the beach for breakfast, and then to church. 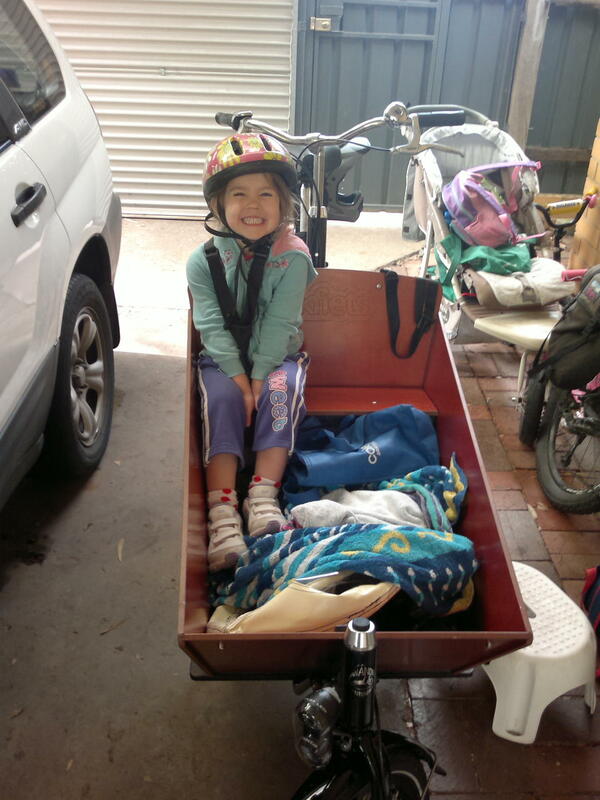 When offered riding in the car to get to church, she was adamant that she wanted to go in the bakfiets. 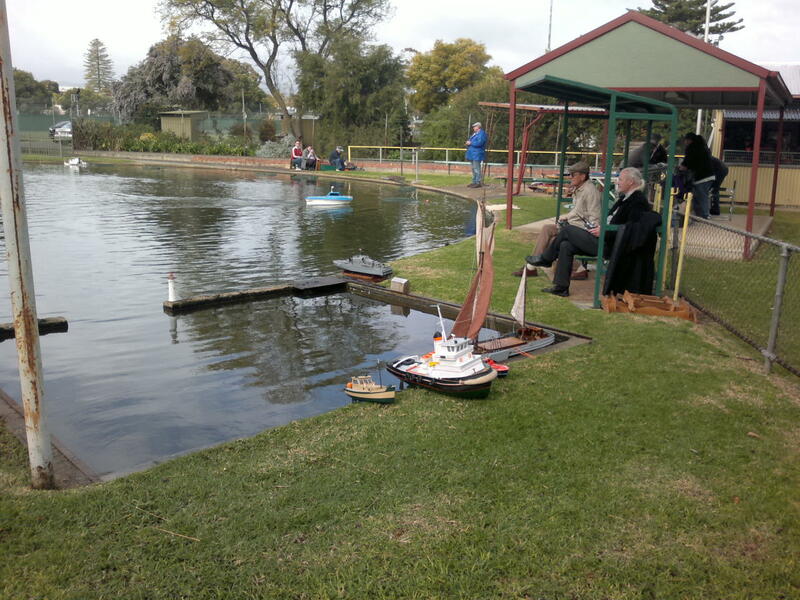 SASMEE is the South Australian Society of Model and Experimental Engineers. 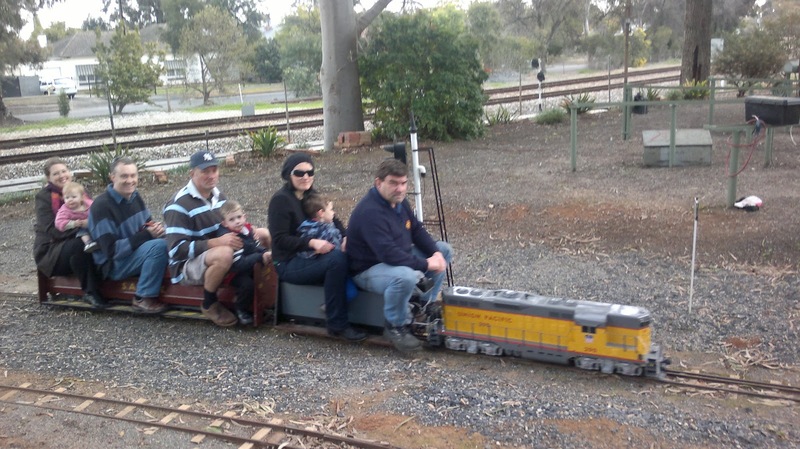 They have a lovely space where the Noarlunga and Belair railway lines join at Millswood, about 6km from our place by bike trail. 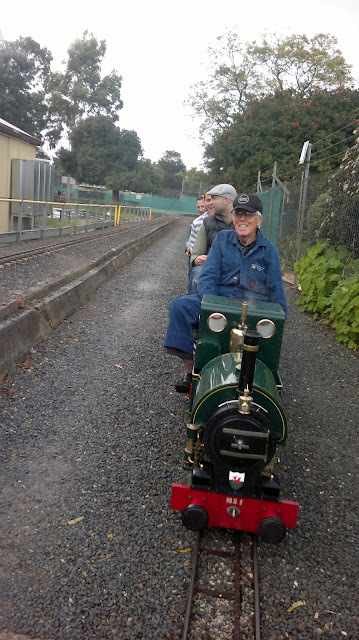 For $5 for adults and $3 for kids you get entry for the afternoon, oogling at stationary engines, a model boat pool full of all manner of radio controlled craft, and a fairly extensive model railway network with free rides. The queues take a while to go through, but in the meantime you have a good view of all sorts of model trains carting other people around the place. Plenty of fun for Miss 4.5 and Daddy. The weather was fine when we set out, so Isabel opted for no canopy so that she could "fly all the way there". I had heard that it was possible to wrangle the weather canopy into the box, so with a minute or so of experimentation I was able to twist it around so that it would fit in the box. I secured it from springing back out with a 3m ratchet strap wrapped around it several times and tensioned up a bit. Maybe I will video how I did it some time. Isabel ready for departure to SASMEE Park. The weather looked okay, so she opted for no canopy, but we packed it in the bottom of the box along with snacks and general stuff. To get there we rode along Winston Ave towards the city, and then took the last street on the right before the train line, then first on the left, and follow the road until the small sign and endless stream of people revealed the laneway leading to the SASMEE entrance. It was quite easy to navigate the bakfiets there. Isabel and I chatted away much of the way. SASMEE park has plenty of room to park your bike by the ticket house inside the gate, which was great. I felt comfortable just using the AXA Defender lock that is built in to the bakfiets. The ticket man politely asked me to park the bike in the designated spot, making the experience quite simple and clear as to what we were to do. 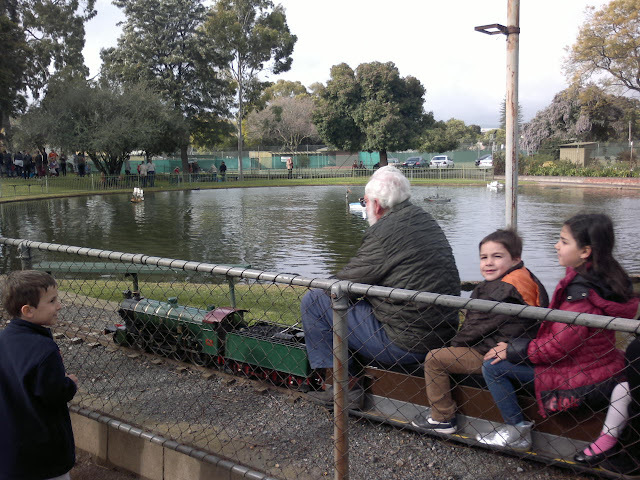 Then it was time for fun, watching all the little trains and boats. One of the model trains going past the boat pool will galleon in full sail. The boat pool even has a harbour. We quickly joined the queue for one of the stations, and waited until we made it to the front of the queue for our first ride. We ended up on this train, immediately behind the driver. Isabel while we were in the queue for our first ride. 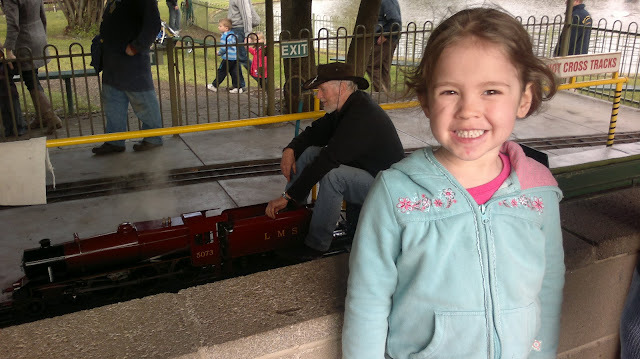 As it happens, we ended up on the train you can see behind her. Then we bumped into some good friends who were also there. Lots of little people at SASMEE park having lots of fun (and occasionally getting upset when they have to get off the train again). We also bumped into some good friends while we were there. The driver on our second ride stopped at a green light, which initially confused me until I realised it was for him to be given a mug of hot tea. It isn't just the trains that need fuelling. I took the opportunity to snap the train that pulled up behind us while our driver took his tea. The train behind us while we were stopped so that our driver could get given his cup of tea. Then it was time to ride home, into a bit of a headwind. It probably took 30 minutes to go from Parkholme Shopping Centre to SASMEE park, and about 40 minutes to get home again.